Every Wednesday Night June through August in Downtown Lemont. Each week a different car is featured and three Cool Car Trophies are awarded. This event features a DJ every week, a food court, and raffles. 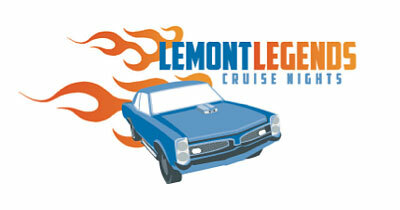 The Lemont Legends Cruise Nights is recognized as one of the largest and best car shows in the area. This event attracts hundreds of visitors and participants to Downtown Lemont every week. You can also take this opportunity to promote your business as a Cruise Night sponsor.